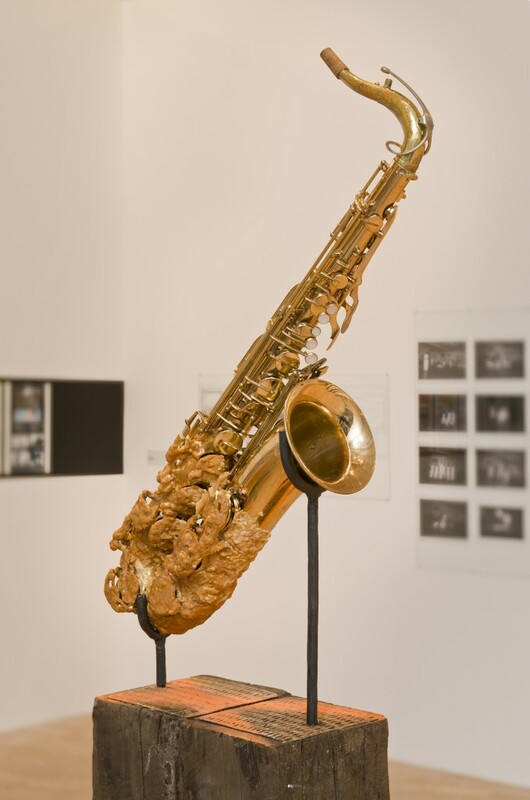 Jamal Cyrus’s sculpture Texas Fried Tenor (2012) resulted from a performance called “Learning to Work the Saxophone,” which references a line from “Deacon Blues” (1977), a song by Steely Dan. 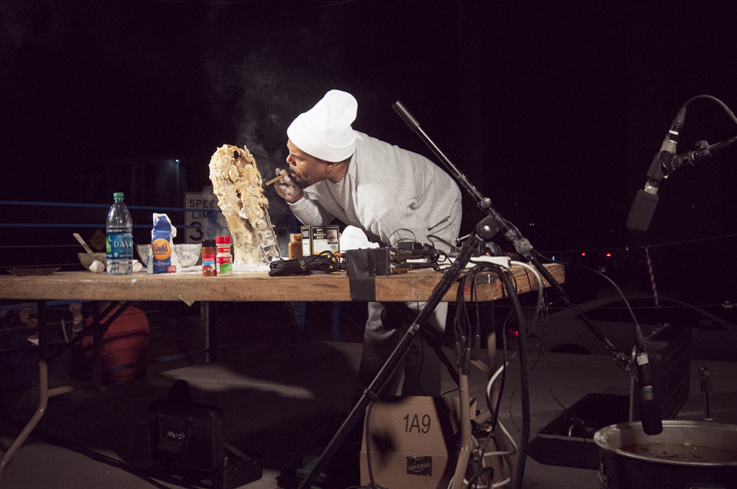 In his live performance of Texas Fried Tenor, Cyrus sets the stage with a long table in cooking-class style and demonstrates the proper way to bread and then deep-fry a saxophone. First preparing the breading with eggs, flour and milk, and then adhering the mixture to the instrument, he amplifies the sound of the grease in the fryer and recites a recipe/poem, thus creating a new musical score and sound work. Taking a matter-of-fact approach to his unlikely culinary demonstration and officious recitation, Cyrus conflates several cultural signifiers while embodying, in a witty and original way, both the musical and culinary contributions blacks have made to American culture, in particular, the creation of the blues and jazz. Musically, Cyrus draws on avant-garde movements of the 1960s, including improvisational jazz techniques and Fluxus, which employed eccentric materials, spectacle and experimental modalities of performances. Jamal Cyrus received his BFA from the University of Houston in 2004 and participated in theSkowhegan School of Painting and Sculpture in 2005. He earned an MFA from the University of Pennsylvania in 2008. His solo exhibitions include DKONKR, Bryan Miller Gallery, Houston (2011); Jamal Cyrus: Winners Have Yet to Be Announced, The Kitchen, New York (2009); and Jamal Cyrus: New Works, Bryan Miller Gallery (CTRL), Houston (2007). His group exhibitions include Fore, The Studio Museum in Harlem, New York (2012); The Bearden Project, The Studio Museum in Harlem (2012);Texas Prize Exhibition, Arthouse at the Jones Center, Austin (2012); Museum as Hub: Alpha’s Bet Is Not Over Yet!, New Museum, New York (2011); 10.2 International Artist-in-Residence program, Artspace, San Antonio, TX (2010); Huckleberry Finn, CCA Wattis Institute for Contemporary Arts, San Francisco; Landfall, Museum of London Docklands (2009); After 1968: Contemporary Artists and the Civil Rights Legacy, High Museum of Art, Atlanta (2008); Lessons from Below: Otabenga Jones and Associates, Menil Collection, Houston (2007); Alabama, Office Baroque Gallery, Antwerp, Belgium (2007); When the Revolution Comes, Kathleen Cullen Gallery, New York (2007); Day for Night, Whitney Biennial, Whitney Museum of American Art, New York (2006); New American Talent: The Nineteenth Exhibition, Arthouse, Austin (2004); The Big Show, Lawndale Art Center, Houston (2003); Butta Phat, Eldorado Ballroom, Houston (2000); Preventions, Project Row Houses / Community Artist Collective, Houston (1996); and Houston Area Exhibition, Blaffer Art Museum, University of Houston (1996).